I am still having problems with my PC........... Now it's been resetting it self, So here in the next 30 minutes I am going to Best Buy and buy the Conair 650W PSU, The computer store here in town won't take this PSU back, Well that was a $65.00 mistake. As for my video card I can't say yet, I have to fix the reset issue. I've booted into the bios and let the PC sit for awhile after 15 min or so the PC will reset every 5 minutes. I think it's the PSU is causing the PC too reset. What I did to verifiy this is I installed my old NVidia 7300 video card that still works and the the PC still resets so I know its not my video card causing the PC to reset. Perhaps it´s all me writing about things that makes everybody's PC screw things up. Your PC will reset itself? From what Sunny? Do you mean it reboots in a cycle 2-3 times before it settles? What I mean by reset is a hard reset before the OS even loads the PC will reset, but just before the PC reset the PSU will make a clicking sound and then the PC will reset it self. I just got back from Best Buy and I bought a Consair TX750W instead it was only $20.00 more. Plus I do have four 10,000 RPM Seagate 500GB SATA drives, I looked for the HX that you mentioned and didn't see that on any of the PSU in stock. I did notice the price on the NVidia GTX260 that you mentioned and it was $239.00 which is $60.00 more than the ATi 4890 card was. I think you will be happy with that Corsair 750W Sunny and the HX model was only if you wanted it to be modular. It is faster than my GTX 285 and a lot faster than a stock ATI 4890 and almost as fast as a ATI 5850. It sells for 207$ at newegg with an additional 7$ for shipping. Not a bad choice if one needs a Nvidia card. 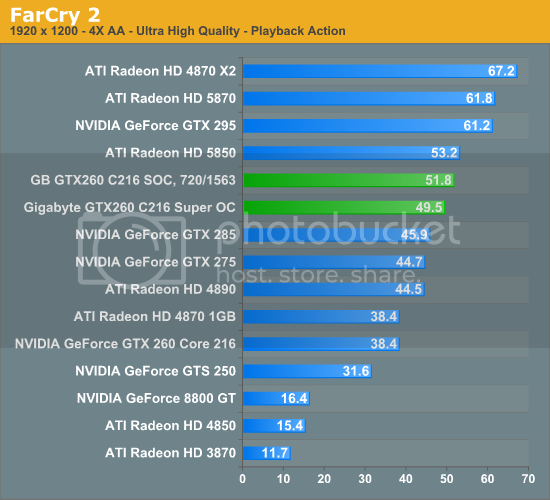 But again I have not checked prices on the GTX 275 - but the fact it beats my 400$ GTX 285 card is pretty good. righto i might have some usefull infomation now. after running the GPUZ sensor log. i was lucky enough to have it freeze up. this time it froze up on the loading screen to a offline race. the GPU load 1 second before was 63%, and the controler load was 23%. what the hell is causing the GPU load to jump from 63% -> 100% in less than 1 second? the only thing i was running in the background was windows media player, as i like to listen to music while i race. windows media player is on a seperate screen and minimized. it occurs when WMP is not open. I do not know why it does this - could it be a specific driver issue with GTX 285 in this game? Sometimes fps it terrible low when the game loads - perhaps something causes this within the game - do not know if others are seeing similar things. i'm not sure.. but i've sent a e-mail through to nvidia customer support and see what they say ( if they reply that is). yeah i've noticed that aswell.. online or offline the loading screen can range from 60FPS to 1-2FPS at times. it happened again not long after i posted that message, GPU load was only around 20%.. its really strange. Hmm i wonder if my pc will be ok i cant see any reason why it would struggle with anything what do u recon? Thanks for all the efforts you took to send us this information we requested. With the information provided by I understand that GPU is overheating as it should be within the range of 75 or 80 C max. I suspect that the graphics card is malfunctioning. There could be some hardware issues with the graphics card, so I request you to contact the card manufacturer for further assistance. The reason why I am directing you to the card manufacturer is, we at NVIDIA manufacture the basic chipset for the graphics cards and sell them to our partner manufacturing companies like PNY, BFG, EVGA, XFX, MSI, LEADTEK, etc, and even to some of the OEMs like HP, APPLE, DELL, etc… These manufacturers use our technology and make custom graphics cards. Hence, I would request you to contact your graphics card manufacturer. Please feel free to contact us, if you have any further questions. NFI how i'm going to keep it under 60*c with 100% fan speed. i was thining of getting a warranty check done on it by XFX... but NFI where the receipt is. =_= might aswell upgrade to the GTX 295 and be done with it. I agree with Nvidia that 80 degrees celsius is too high, and if you see these kind of temperatures when playing you should use a higher fan speed. I would not exchange that card if you do not have problems with it in any other games. Is is freezing in any toher game? It could be a driver issue - remember how Nvidia tried to better the performance in Shift after ATI got their driver update? I would not be surprised if the freezing could be related to the fact that Shift got a patch update and Nvidia launched new drivers with performance boost in Shift. That could be why fps are extremely low sometimes when the game loads. I would not be surprised if it is a game patch bug or driver bug and not your card that is the problem. You could try and reinstall the game - without the Shift patch (first make a backup of your current career file and rename it) and see if it still freezes. You should install an old driver first (like 1.90.62) before you reinstall the game. Then you can download Jeff´s career save file and try to see if your PC freezes. If it does not, then install your current driver - test again and if things are fine you could install the patch. Then you will know if it has something to do with drivers or if it is the patch. I have no idea on what to do besides this to check what could be the problem. I think my problem has finally been resolved, The new 750W PSU sure made a big difference. This Corsair PSU was really package nicely, plus it has long azz cables. I had to use a entire drive bay to store all the extra cables in. As far as the video card I am getting between 35 & 45 frs using fraps. I think my out PSU took out my video card and thats why the last video card only lasted one year, I also use to have a hard drive problem where you could hear the head knocking and that problem has since clear up with the addition of the new PSU. So thank you Poul & Aaron for all your advise in helping me resolve my computer issue's I plan on building a new PC this year, I 'm going to buy the smaller box like the one you have , with the PSU on the bottom, I have an issue with the distance between my PSU and my heat sink, there's just not enough room to get a good heat sink in there. it was also freezing up on Call Of Duty : Modern Warefare 2 aswell. he said that they have had quite a number of GTX 285 black edition overclocked cards come back with faults. the card that he gave me was not a overclocked card, just your run of the mill GTX 285. ran a furmark stability test for 2 hours, and played a small ammount of COD: MW without any errors. called them this morning and told them what the new card was like, and they concluded that the card was deemed faulty. also on the hunt for some aftermarket GPU cooling. any suggestions? My God I had no idea you had problems in other games as well. Glad to hear you can get a new one - go for the 2GB version. The GTX 295 is almost identical to being 2x GTX 275 GPU´s in one card. Aftermarket cooling. I use a Arctic Cooling Accelero Extreme GTX 280 on my card, but you need to buy additional mosfets to cool the VRM regulators and the sticky tape is not very good on the heatsinks - you need to heat them up before you attach them. But they made an updated version called Arctic Cooling Accelero Xtreme GTX PRO and for this you should not have to do anything other than install it. I searched for the GTX PRO version and found this - remember to see if you can find it cheaper anywhere. I tested my Accelero Extreme 280 once and my temperatures are extremely low. Remember they would be even lower if I had no overclock on my card. funnly enough i was thinking of going with that model of cooler. i'll have to see if i can get it in australia. if not. i'll be importing it. those temps are deffinatly lower than mine. but what are the weather temps like there at the moment? we've been getting 34*c - 37*c temps contantly, so it might of contributed to the death of this card. i've got to wait a week untill the 2GB version arrives as they have to go through the whole warranty process e.t.c at the moment while the Pc is at idle. its sitting at 65*c =_= . looking forward to running online again in shift. been a while since i've had good racing.